2014 Suzuki Access 125. Picture credits - Suzuki. Submit more pictures. 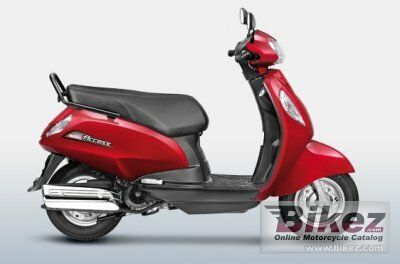 ACCESS is sporty and designed exclusively for every member of the Indian family as proven with overwhelming response. Powered by a 125cc air cooled, 4-stroke engine, Suzuki Access is equipped with automatic transmission for convenience in city riding conditions. It is also equipped with Xtra Torque Performance (XTP) for more power and faster pick up. Its attractive and aerodynamic styling also assures of a rust free body thus reducing maintenance expenses. Ask questions Join the 14 Suzuki Access 125 discussion group or the general Suzuki discussion group.